For much of the second season of Rebels, the show has adopted a serialized approach to telling the stories of our heroes aboard the Ghost. 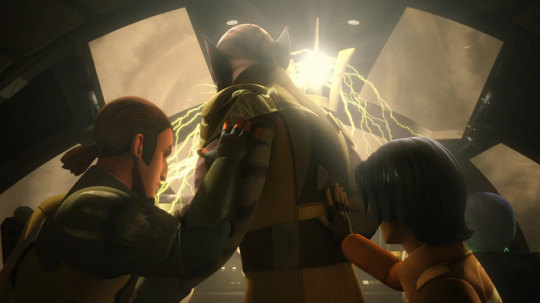 In the first part of the season, we even had a two episode story arc which served as an introductory vessel for Captain Rex and the rest of the clone troopers. There has been exceptions however, and most often they are connected to episodes designed to provide more background and characterization for various heroes. 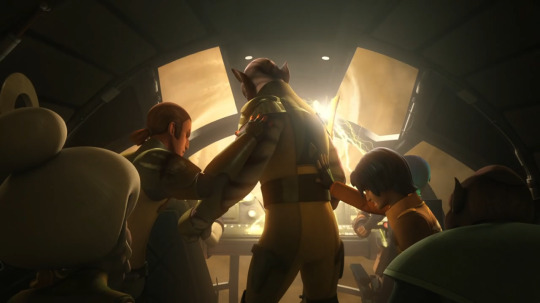 Ezra Bridger enjoyed a stand alone episode in “Brothers of the Broken Horn,” and Sabine Wren just recently benefited from “The Protector of the Concord Dawn.” “Legends of the Lasat” serves the same purpose for our oversized proto-wookie, Zeb. It begins, coincidentally, with a call back to Ezra’s standalone episode, “Brothers of the Broken Horn,” as he leads the group on a mission to rescue refugees being hunted by the Empire. 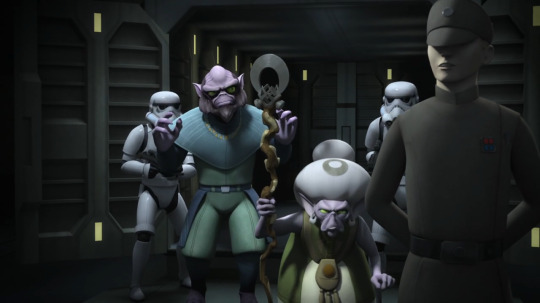 The call back actually involves two things from that episode: one, the location is the same planet which Ezra visited with a new associate; and two, that new associate, but an old face to fans of The Clone Wars, Hondo Ohnaka, who turns up being the source on the refugees. The rebels are almost too late, arriving just in time to take out a small storm trooper squad taking other Lasat into custody. It’s surprising for Zeb, as he thought himself one of the last of his people. Instead, he meets two Lasat, an aged, white-haired and bent by time female Lasat named Chava, and a scarred and worn down former warrior named Gron. Both recognize Zeb for who he was in the past, a captain of the Honor Guard of Lasan. Everyone comfortably aboard the Ghost, except Hondo, who enjoyed a free trip to Agent Kallus’ cruiser, we learn more about the Lasat and what happened to their home of Lasan, as well more about Zeb. He was a captain in charge of protecting the royal family of the Lasan and the rest of the Lasat, and it appeared the Lasat had put up a stiff resistance to an Imperial attack. Why the Empire was in the process of attacking the planet is left unknown, but a particularly powerful bomb knocked Zeb unconscious and seemingly helped bring the battle to a close. We also learned that Kanan found and rescued Zeb (perhaps something to be explored in Marvel’s Kanan, now that it’s been established how close the two works are operating). An answer is also offered on the distinct lack of Lasat roaming the galaxy, the Empire is actively hunting them down and killing them. As Gron explains, it’s to hide up the fact of the atrocities they performed on Lasan, including destroying the planet’s surface to the point of no longer being inhabitable. Our final lesson on Lasan history provides the impetus for our second and third acts. The elderly Chava explains the Ashla, which we are told by way of conversation between Ezra and Kanan, is another name for the Force, though Chava refers to it as the soul/spirit of the galaxy. It’s through the Ashla, Chava further explains, that an ancient Lasat legend will reveal the new home of the Lasat, New Lasan. Zeb is immediately cynical about the prophecy, though his two fellow Lasat display quite the fervor for its importance with Chava performing a ceremony to reveal where the new home planet of the Lasat is located. At this point, the episode dips into what we might congenially call the mysticism of the Force. The mystic elements of the Force are what drive the Star Wars universe into the realm of fantasy and were heavily explored in The Clone Wars. In this case, the ceremony through the application of Zeb’s bo-rifle and a map projected by Chopper, reveals a planet in a system beyond the Outer Rim and in uncharted space. Without hesitation, the crew of the Ghost agree to proceed to this special planet. Up to this point, beyond simply offering information about Zeb’s past, we are granted some emotional depth into Zeb’s character. He suffers from a mixture of survivor guilt and general shame over his failure to protect his people. In Chava’s prophecy, however, he is anointed as a figure selected by the Force. He is a savior-figure. 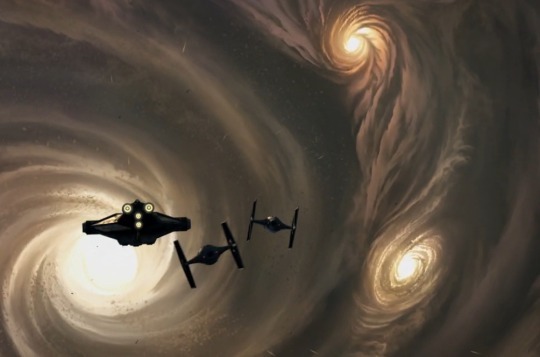 The travel of the Ghost through the dangerous realm of uncharted space comes to a screeching halt by what Hera calls “an imploded star cluster.” Imagine the black hole from Christopher Nolan’s Interstellar multiplied and sprinkled throughout a hazy cloud hanging in space. It’s a beautiful setting and is accompanied by arguably some of the best scoring any Rebels’ episode has enjoyed yet so far. 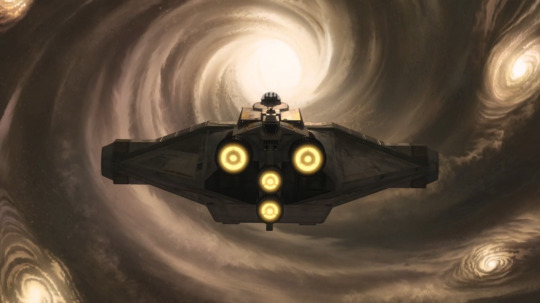 The cluster of imploded stars halts their progress as they try to figure out how to go around it, providing time for Kallus and his Imperial cruiser to appear behind them – lead to their location by a tracking device planted on a transmitter given to Ezra by Hondo. For all intents and purposes, the Ghost is backed up against a veritable galactic wall. It cannot go forward without being ripped apart by the gravitation and the Imperial ship blocks its movement in any other direction. Kallus is of this same opinion and orders the rebels to surrender, but surrender is not an option. Chava, upon seeing the imploded star cluster, happily announces it’s the ‘maze’ foretold by the prophecy and urges everyone forward – that Zeb will know the way. In this moment, it’s hard to tell if Zeb truly has any inkling of what he’s doing or if he is simply placing his faith in a legend of his people. In response to Chava’s encouragement, Zeb takes his bo-rifle, which early he had been instructed to use in the same manner as the ancient Lasat. Then, it had produced a bright yellow crackling energy, and now it does so again and Zeb essentially spears the consoles of the Ghost’s cockpit with his weapon. The music surging, the bo-rifle and the energy essentially take over the Ghost and cover its exterior with yellow lightning which repulses the intense gravity pull of the imploded stars as the ship is moved forward into them. Kallus orders two TIEs to attack, only to watch them ripped apart by the powerful gravity and wisely makes the decision to withdraw as his own ship begins to pull apart. Supported by Kanan and Ezra, Zeb guides the Ghost into the stars and shortly thereafter we are greeted with several planets within the cluster orbiting a bright yellow sun. One might reflect on the Biblical story of Exodus at this point with New Lasan considered the ‘Holy Land.’ In Exodus, Moses is forbidden from ever actually setting foot into the new home of the Hebrews, who had fled destruction and enslavement by the Egyptians. He was granted the chance to see it from a far before his death, but that was it. Here, we and the crew of the Ghost, minus Zeb, are placed in the role of Moses. We get to see New Lassan, but we don’t get to travel to it. Zeb escorts his fellow Lasats two the planet, and upon return, we are told that the planet is actually the original home of the Lasats and is still populated by them. The episode concludes with the happy ending that the Ghost recorded the route to the planet and any future Lasat they encounter can be shown the way to this new old home and safety. “Legends of the Lasat,” succeeds in multiple ways, even if it does not advance the over all story of the rebels, in general. We are given more information about both Zeb’s and his people’s past. We are also granted a deeper, more tragic characterization of Zeb. He isn’t just the ‘muscle’ of the crew, but an individual who has suffered great loss and carries (at least to now) quite a bit of shame and guilt for something he incorrectly concludes to be of his own failing: the defeat and slaughter of his people. In this light, it’s not surprising that Zeb is often the most grumpy or bitter member of the Ghost’s crew. In addition to the story and character elements, the concluding animation in the final act and the accompanying score were simply incredible. 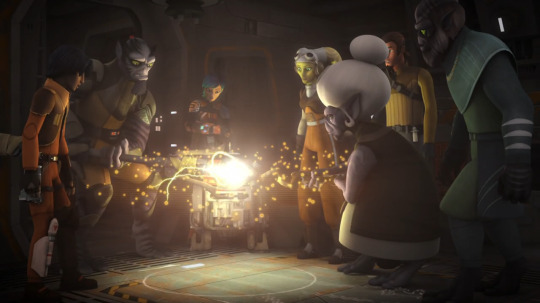 So far as we can simply rely upon the mystic powers of the Force and overlook the heavy dose of deus ex machina (or should we say, deus ex bo-rifle), “Legends of the Lasat” is another fantastic addition to Season Two of Rebels.